On 19 October 2017, the newly formed Uyghur Friendship Group, in collaboration with MEPs Csaba Sógor and Ilhan Kyuchyuk, marked its inaugural event with a celebration of the Uyghur culture. The launch brought together a variety of people including representatives from NGOs, MEPs, members of the Uyghur diaspora and the wider public and drew attention to this people’s vibrant culture, while also calling for the need to protect their cultural rights. 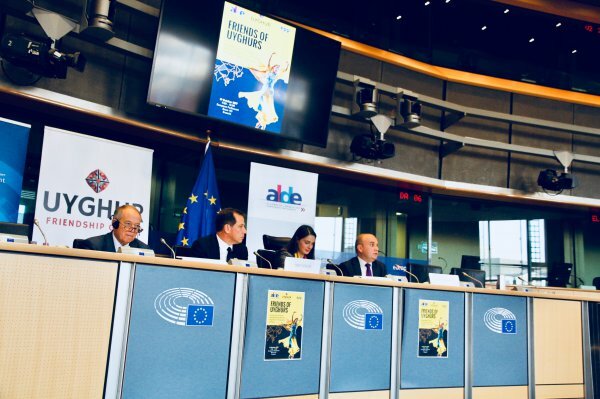 The event kicked off with UNPO Advocacy Officer Lucia Parrucci reminding the room that the European Parliament has a long history of addressing the gross violations of human rights that have historically taken place against the Uyghur Community in China. Given this, she stressed, it is a natural step that the Friendship Group should convene at the European Parliament. Furthermore she underlined that the event itself is a big step forward in giving space for a dialogue in which human rights violations against the Uyghurs can be substantively addressed. The conference was held by three Co-Chairs of the Friendship Group. Both MEPs Kyuchyuk and Sógor, in their opening remarks, discussed the deteriorating human, cultural and religious rights that the Uyghurs are facing at the hands of the Chinese authorities. Mr Kyuchyuk drew attention to the fact that all the elements that makes their culture unique and indeed ‘the essence of their culture’, is being tightly controlled and targeted; an example being a recently introduced ban restricting Uyghur youth from speaking their native language in schools. He closed his statement by stating that it is the responsibility of the MEPs to scrutinise and speak out against what is happening in the country and beyond and of other institutions in the European Union (EU) to press on their Chinese counterparts to restore the full cultural rights of the Uyghurs. Mr Sógor talked about China’s duty to uphold the fundamental human rights of its minorities, such as the Uyghurs, if they want to carry on playing a prominent role in international affairs. Commenting on the group itself, he emphasised that the friendship group is not restricted to Uyghurs, but also open to all of China’s peoples. The ultimate goal of this friendship group should be for representatives of minorities to one day see the respect for their rights, enshrined in the Chinese constitution, actually implemented. The most important thing is for a dialogue to take place between EU member States, promoting the Uyghur culture and also raising awareness of its precarious situation. Senator Compagna echoed the sentiments of both co-chairs, stating the need to express guarantees for the Uyghurs. Commenting on the ‘uneasy moment for the minority’, he went on to emphasise the need for the international community to stand with the Uyghurs. The event saw a mix of academics, representatives of NGOs and Uyghur community members speak about the situation minorities and human rights defenders find themselves into at the hands of the Chinese government. Dr. Marie Holzmann spoke about Ilham Tohti as well as the way in which Chinese President Xi Jinping is holding on to power. She talked about the hypocrisy of the People’s Republic’s regime, wanting to appear liberal and wanting to sponsor development around the world, whilst creating and maintaining the myth of the ‘powerful enemy’, namely Western powers and their liberal and progressive values. For the sake of attempting to unite the country, China thus cracks down heavily on human rights - bad news for the Uyghurs and other minorities in the country. Specifically regarding Ilham Tohti, she commended his struggle for a fairer and freer China through open dialogue. On the same token, she drew on the recent case of Liu Xiaobo as a point of worry, stressing that Ilham might face the same fate. Because of his worsening conditions in prison, she pointed out the best thing the international community could do from the outside was to bring attention to his activism. In this vein, motivated activists are aiming to get him the Nobel Peace Prize. Similar thoughts on Ilham Tohti were expressed by Ms Vanessa Frangville, who spoke fondly of her time having him as a professor, despite him having been forbidden from teaching at the time. She additionally spoke about the need for initiatives like the Friendship group to be embraced by academia as well. The daughter of Ilham Tohti, Ms Jewhler Tohti, also sent a video message in which she expressed her deep gratitude for the group supporting her father and hop for continuous support of her father while he is imprisoned and until his release. The latter half of the launch saw Ms Rabiya Kabeer, leader of the Uyghur people, give a speech in which she thanked the group for its solidarity, showing `shared values and destiny’ for a better future in China. Stressing that the support of members of European Parliament is vital at this current juncture, she also encouraged the Uyghur diaspora to share its culture with those they meet overseas in order to counter the People’s Republic’s attempts to dilute it. Mr Vincent Metten, from the International Campaign for Tibet (ICT), praised the creation of the Friendship Group, drawing parallels with the Tibetan Interest Group in the Parliament. Highlighting the long-standing relationship between the ICT, and the World Uyghur Congress, Mr Metten spoke of the strong need for both groups to support each other against the Chinese government’s suppression of minority rights. Finally, Ablet Semet gave a presentation focussing on the rich language of the Uyghurs, detailing the key role it has played in developing the culture and attitude of the Uyghur people. Following this was a presentation on the history of the Uyghurs entitled ‘Uyghur Culture: Source of Identity, Values and Moral Guidance’, by a member of the Uyghur diaspora, Mr Nury Turkel. The celebration of the Uyghur culture and identity marked the end of the event, with a representative of the London Uyghur Choir sharing her favourite songs and translations with the group, as well as traditional Uyghur dancing in conclusion of the event.